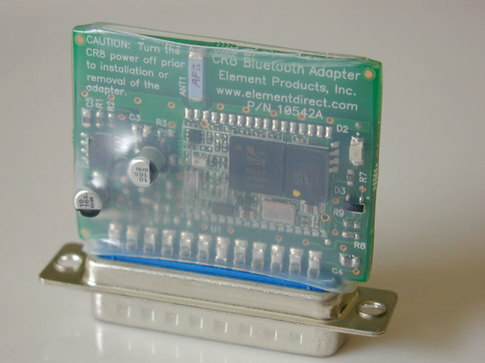 The Bluetooth specification is a low-cost, low-power radio standard that is used for wirelessly connecting devices. Global acceptance of this specification has helped incorporate limited range wireless communication into everything from automobiles to web players. Based on a nifty time-sharing architecture featuring frequency-hopping and tiny packet sizes, Bluetooth uses the 2.4GHz radio band with a range of approximately 30 feet. There, BAM, sever the tether. When BAM is pairing with your Bluetooth host its LED will rapidly flash. Once a connection has been established, the onboard BAM LED will continue to flash at a rate of once per second. Doctor, you have a pulse. BAM, itself, only uses four of the Cargo Bay Connector’s pins: RXD, TXD, +5V, and GND. 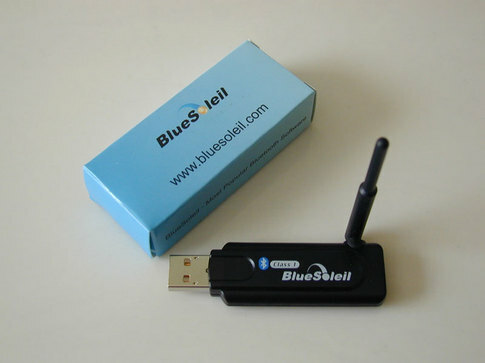 If your Create development platform is lacking Bluetooth communication capability, the Bluetooth Dongle with BlueSoleil host software is a painless way to interface with BAM. This Class 1 Bluetooth radio plugs into any free USB V.1.1 port. And you can forget all of those pairing headaches commonly found with other USB radios, the BlueSoleil USB dongle is a screamer with a maximum transmission range of approximately 300 feet. 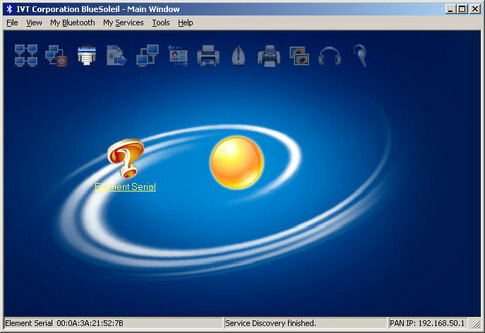 The BlueSoleil Host Software will run on Windows 2000, XP & Vista enabling quick and easy communication setup with BAM. 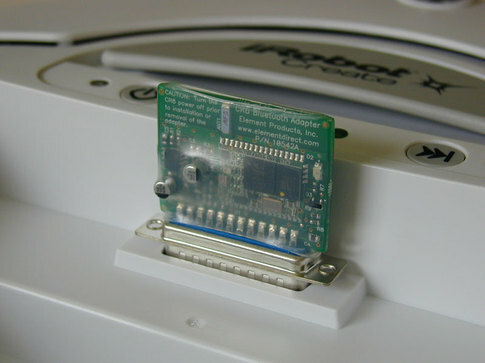 Likewise, you can connect with the BlueSoleil USB dongle natively inside Mac OS X, Linux, and even Windows by forgoing the BlueSoleil Host Software. By using a terminal application, like RealTerm, you can stream OI command strings to your Create for instant programming actions. Furthermore, by using a powerful hacking trick with the terminal application, you can send large, more comprehensive binary scripts to your Create. Prior to sending your binary file scripts, just remember to set the Character Delay field in RealTerm to 20mS, then load a binary script, and send the file to Create—wirelessly. In addition to controlling the Create with these binary scripts, you can use the terminal application for reading Create's sensors. There you go; remote, autonomous, wireless control script programming at its easiest. How do you make a Create binary file? Well, first of all you will need the Create Open Interface Specification. This manual will help you determine the hexadecimal codes that are needed for writing your script. Next, you will need a binary/hex file viewer/editor. 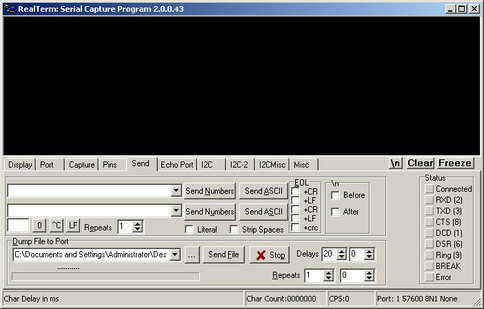 HHD Free Hex Editor by HHD Software is a free (duh; that’s its name), Windows application that can be used for building long scripts of Create OI command strings. All of this power without programming a single line of C++ code. Moo-ha-ha. Finally, save your script as a binary file with the extension BIN and load your brand new shiny binary file into RealTerm with the Dump File to Port dialog. When you are ready to test your script, press the Send File button, sit back, and control Create from the comfort of your easy chair. You couldn’t ask for a better way to create your own robot. Hey, How About That Other Robot? You’re right, the LEGO NXT brick has Bluetooth on board, too. The LEGO NXT brick is equipped with a CSR BlueCore 4 2.0 +EDR system. The CSR main offering is BlueCore. BlueCore is a fully integrated 2.4 GHz radio, base band and microcontroller used in over 60 per cent of all qualified Bluetooth v1.1 and v1.2 enabled products.